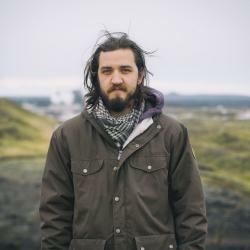 ‘Einn’ (“One”) follows the story of Helgi Dagur, an Icelandic filmmaker who struggles to maintain his artistic vision as greedy studio producers try to make him alter his film. With each compromise made, Helgi’s personal life also changes, and soon a transvestite crime lord is pursuing him. Thankfully Helgi meets a flying two metre tall puffin that guides him through his cannabis-fuelled meltdown. Elvar Gunnarsson, the man behind ‘Einn,’ came up with the idea for the film whilst teaching at the Icelandic Film School. There he met several teachers and film makers who regretted not having pursued their dreams earlier in life, which in turn inspired the fictional character of Helgi Dagur whose god-complex leads him on a quest to get his masterpiece script turned into a blockbuster. Much like the protagonist in Federico Fellini’s ‘8 1/2,’ who retreats into his fantasies when the film industry puts pressure on him, Helgi Dagur’s personal demons come crawling out when his producers try to contaminate his vision. Elvar maintains that it’s not a pro-smoking film though, as Helgi’s circumstances are not improved by getting high. “It’s a fun catalyst to fuel Helgi’s breakdown,” he says. He also believes cannabis smoking has not been talked about much in a realistic or intellectual manner in Icelandic films, which presents an opportunity to do something new. Elvar Gunnarson believes going with a studio would have meant compromising his vision, so instead he decided to make ‘Einn’ himself—directing, writing, producing, acting in and making the soundtrack for the film. “If I had worked with a studio, I would never have gotten away with making this kind of cannabis film with a giant puffin. Society hasn’t progressed any further than that, I’m afraid, and I didn’t want to leave anything out,” he says. By going independent, Elvar avoided a lot of the problems Helgi runs into. There’s nobody to rush him to meet deadlines, change his script, or tell him which subjects the film can explore. He had other problems though. Filming sporadically over a three-year-period presented more scheduling conflicts and he had child actors growing up, but with the right attitude these hitches were far from insurmountable. “Even if only half the cast and crew showed up for a take, and the equipment was held together by tape, our motto was always ‘If we don’t have it, then we don’t really need it,’” Elvar explains. Elvar also had to find a way to fund the film, assemble a crew, and then distribute the finished product, the last of which is causing him a real headache as he has no experience with marketing. For example, Elvar says it’s tough for Icelandic films to compete for slots with Hollywood blockbusters. A pastiche of fantasy and realism that goes from very serious and gloomy moments to trippy artsy scenes, ‘Einn’ does offer a very different kind of experience than most traditional films, and perhaps the cinema executives will see that in a positive light. Elvar shows me a dream sequence in which Helgi goes to the beach where a bonfire illuminates people destroying a couch, and he stares in disbelief as his mentor, the puffin, gives him vague Nietzschian advice. In another grittier scene, Helgi is sitting on a bench lighting up a joint with his friends, only to be savagely beaten and robbed by two thugs.